Recipes for the new year - Do You Know The Muffin Man? The couple know a thing or two about baking (their first cookbook was about flatbreads) from their trips around the globe. Their books are part travel memoir and part recipe collection. Not a general purpose baking book nor a resource for techniques, but a nice glimpse into baking across cultures. I'm told he is a “celebrity chef” and has some kind of TV show. Heavy emphasis on fruit in this book. Lots of photographs throughout, many step-by-step guides. Hermé has somewhat of a cult following. This edition is a cute pocket-sized hardcover with very tiny print. Many of the recipes are beyond my skills right now and it will be a challenge just to translate not only the French text, but all of the cooking terms too. His imagination and creativity is certainly displayed here. Very detailed instructions written in a conversational tone. Desaulniers has a lot of fun describing the origin of each recipe and even the names are outlandish. The majority of these desserts are complicated and require a stand mixer. A nice touch is including notes on alterations, equipment, flavours and suggestions for how to make each recipe over several days. Very accessible recipes, with ideas for variations included with each one. They stay away from fancy and fussy creations, so everything is very homey. There are some nice step-by-step photo illustrations, including one on how to make a parchment pastry bag. Note that the recipes assume you are using a stand mixer. I heard about this magazine from my aunt and bought this issue after reading a great recommendation on Roots and Grubs. 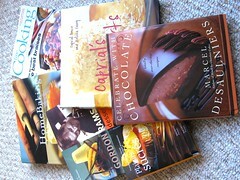 It's glossy, full-colour, packed with advertisements and authored by cookbook writers. They do feature ingredient and product comparisons, some scientific investigations and even nutritional analysis of all recipes. Sort of a mass market Cook's Illustrated.